First water through the Adams Tunnel. Photo credit Northern Water. On Monday at 5:30 pm of this week diversions through the Adams Tunnel to the east slope of the Colorado-Big Thompson Project began. While this picks up, Lake Estes will rise slightly and is expected to be return to typical levels by next mid-week. The Olympus Dam slide gate remains set to release low-level winter flows to the Big Thompson River. This rate of fill will be maintained for several days to ensure safe operations below the Estes Power Plant. 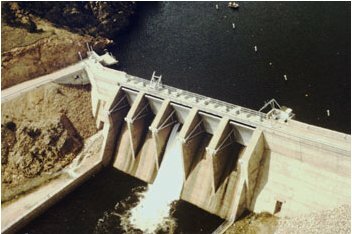 The majority of the water in Lake Estes enters through the power plant via the C-BT Project. Olympus Dam photo via the US Bureau of Reclamation.